1PW wouldn't fill it, it didn't work, I closed Safari window and opened a new one. It did not appear again. I took steps to change my password and add additional security. I'm thinking this is something running locally on my MacBook Pro. Safari 12.0.3, macOS 10.13.6 High Sierra. Referrer: forum-search:"Your login information will be sent securely." We're not affiliated with Malwarebytes, and this is not an official endorsement, but that may help. I'd suggest giving that a go and reporting back. The prompt that you're seeing there is called an "HTTP Basic Authentication" prompt. They're not super common anymore, as most sites / services have moved to using a web form for filling in credentials. They are still somewhat prevalent with devices like consumer grade routers and other networking devices. 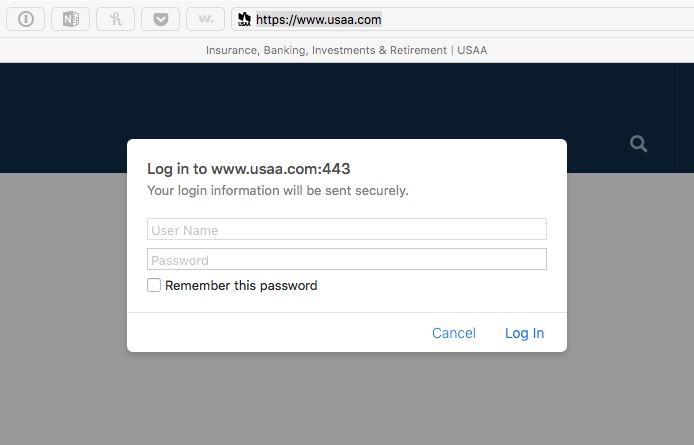 I'm going to do some research and see if there are any other reports of such a prompt from USAA. You may wish to do the same. Do you use any sort of a VPN or proxy server? Do you have any extensions other than 1Password installed in your web browser (if so, which)? From your screenshot it looks like you may have a bunch. You may want to consider limiting those. Did you install any software recently? If so which software, and from where? Have you noticed this happening with any other websites?